Do You Want to Help Your Veterans ? 2018 IPG Socks Collection Drive kick off is November 1st! Collection drive will run from November 1st to December 31st. 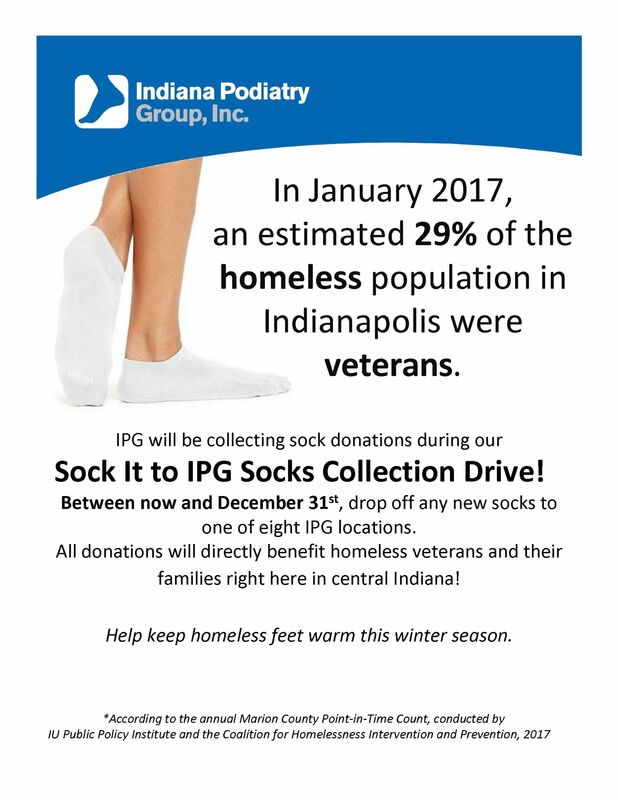 As most of you are aware, IPG holds an annual sock collection drive during the months of November and December for a great cause. As a way to give back to those who served our country, our goal is to collect as many socks as possible to donate to homeless veterans and their families in and around central Indiana. Last year, we collected over 2,800 pairs of socks. In 2015, our first ever collection drive, we collected over 1,100 socks in addition to blankets and our inventory of Rx Crocs. All donations were presented to the Hoosier Veterans Assistance Foundation (HVAF), a local non-profit organization based in Indianapolis that help homeless veterans find jobs and provide them with food, shelter and necessary items. Our efforts have been recognized in the Indy Star newspaper and featured on FOX59 and Channel 4 News. We hope to once again supersede our past donations amount in order to help more homeless veterans than before and educate the public about the adverse consequences of poor footwear and shoe gear. We will present donations the first week of January.